The fix is fairly straightforward: give pedestrians a head start when crossing (something known as a Leading Pedestrian Interval, or LPI). 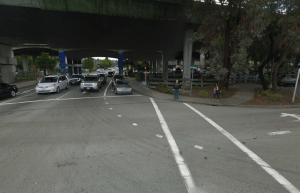 After the light on Heatherton turns red to southbound traffic, pedestrians crossing Heatherton would get a walk sign but Third Street would stay red. Three or four seconds later, Third Street would turn green. Whether or not the truck driver could have seen Olga or her companion before he hit them, they would have been much harder to miss had they had a short head start. As well, rather than trust drivers to give pedestrians priority, the structure of the intersection gives priority to pedestrians instead. The LPI isn’t just window dressing. A study by Michael King in New York City found that a pedestrian head start leads to a 12 percent reduction in crashes over the baseline or 28 percent reduction compared to unmodified intersections, which saw crashes increase by 17 percent over the course of the study. While crashes did still occur, their severity declined 55 percent overall and 68 percent in comparison to unmodified intersections. Elsewhere on the Network today: The Raleigh Connoisseur reports that the city is going to turn a $1.1 million air quality grant into 27 miles of bike infrastructure. UrbanReviewSTL says the near south side of St. Louis has become less of a food desert with the recent influx of new grocers. And Streets.mn argues that the arrival of self-driving cars will make Minnesota’s road expansion plans look even more foolish. Pedestrians behave unpredictably when the environment is not accommodating to them, new research using time-lapse video shows.